This is a Square 14" base with three layers of Butter Pecan cake with Salted Caramel Butter Pecan Cream Cheese filling. 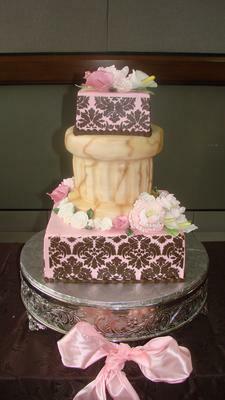 Buttercream icing with a Dark Chocolate Damask stencil overlay. The Column is Butter cake with Buttercream filling 8" top and bottom stand with 3 7" layers in the center of the column. Buttercream icing textured and air brushed to resemble marble. Top square is 6" flavored and decorated the same as the bottom with only 2 layers of cake. Flowers are handmade gumpaste, Peonies, Briar Roses, Roses, Calla Lilly, Stephanotis, and filler flowers in assorted colors to match the chosen icing colors. The cake was entirely edible, and cut for the tasting portion of the expo. It was transported from Waveland Mississippi and assembled on site. The cake was made as an entry for a Bridal Expo in Hattiesburg Mississippi. My first. The theme of the expo was "Survivors", with the sponsor Deanna Favre, for Breast Cancer Awareness. My cake was dedicated to my Step Mother, Judi Valdez Wright. Survivor since 2001. Beautiful cake. I especially love the flowers. Your step mother must be proud!